Week 28 Our letters have arrived! We are now in the process of writing back to our PenPals! As well, we have created a map of Thunder Bay that highlights our “favourite places” for our Pen Pals to read about! HomeSHARE Parents visit the link above with your child. Click on the pins on the map to read each student’s paragraph on their favourite place. Have your child read his/her paragraph to you! Week 27 We are excited to have established Pen Pals with a class in the United Kingdom. In fact, the class that we are writing letters to is Miss Bender’s class. Mr. C taught Miss Bender many years ago at St. Elizabeth school! We are anxiously awaiting our letters! Week 25 Jacob’s mom keeps connected with our class through Twitter. Thanks for sharing Jacob’s creation to compliment his Science inquiry! HomeSHARE Parents consider signing up for a Twitter account to follow our class to see what we are learning on a daily basis. Or simply follow along @cherandpete without even creating an account! Week 24 Being part of a connected classroom allows us to share our work and inspire others! Mr.So’s class enjoyed doing Minecraft selfies as well! Week 23 We were excited that other classes are joining our Walk for Chanie! We recently received this tweet! @cherandpete @ChiversCottage1 our class joins #walkwithchanie after Easter. You've inspired us to collect others! Week 21 Puzzles and board games have proven to be fun and informative ways to continue to build and develop our knowledge and schema of both Canada and the world. These games and puzzles have also developed our reading, problem solving and collaboration skills. We will be providing feedback to the producer of the board games, Outset Media, in the near future! HomeSHARE Have your child tell you some of the facts/information he/she has learned from playing our board games. How many continents/countries can he/she name? Week 20 Being part of a ConnectED Classroom allows us to share our ideas through the powerful, positive use of social media. We are excited that other people are interested in joining our #WalkwithChanie. HomeSHARE: Follow our lead. Share our walk with Chanie idea on social media. Encourage others to get active while remembering Chanie Wenjack. My students will work in French class to practise saying the poem in French! Talk about the power of ConnectED Classrooms! HomeSHARE: Students, listen to the French version of Don’t Quit with your parents. Can you say a line or two fluently? We are now in the process of voice recording the poems for our French friends! We are looking forward to sharing with them! Check out the screen recording Mr.C made to help guide his students to publish successful “podcasts” (voice recordings). Weeks 15 and 16 After our class read and responded to Mr. Peterson’s Blog “Code A Snowflake” our class was inspired to try coding snowflakes ourselves! This simple activity lead us into an 8 day long inquiry on snowflakes. All of our Christian Living, Reading, Writing, Art, Science, Media Literacy and Math was inspired from the snowflake. Read about our incredible inquiry and view the students’ amazing work by visiting: “The Snowflake”. HomeSHARE: Students, visit our “The Snowflake” blog with your parents. Read it with them and share your favourite work with your parents. Share what you learned about snowflakes. Mr.C was very excited to travel to Google Headquarters in Chicago to work with Google Earth, National Geographic and a team of 20 educators from across North America. This experience will create even more opportunities for our class! While in Chicago, Mr. C kept in touch with the class via Twitter and even challenged them with a math question! HomeSHARE: Students, watch the video of your learning space with your parents. Talk to them about it! Explain why you enjoy learning in our classroom. If you could change one thing what would it be? Our puzzles have arrived! 9 for Mr. Prezio’s class and 9 for ours! We can’t wait to start learning more about the physical geography of our world as we take our first serious steps to becoming global citizens who can and will make a difference. HomeSHARE: Together name the 7 continents and five oceans. How many countries can you name from each continent? Mr. Cameron is working on a project “Building Global Citizens Through Social Studies Inquiries” with his friend and fellow teacher, Mr. Prezio. We connected with the board game maker Outset Media to pitch our idea for bringing board games into our classrooms as spring boards for learning.This week we were very excited to receive 12 board games each per class! We can’t wait to start playing and…. learning! Thanks Outset Media for your support of our project. Look forward to hearing how our students are enjoying your games and receiving input and feedback. HomeSHARE: Research Outset Media. What can you learn? Our class is very excited to connect and partner with Mrs. Shaughnessy’s class to put in a “TBayTel for Good” proposal for the “Good School’s” program. Below is the application that we wrote together and our video. Wish us luck! Mr.C often blogs about all the great learning that happens in our classroom. The students sometimes help him compose and edit the blogs. Since the blogs are often about our class and what we do, it makes us realize that teachers are interested in learning from us and that we have a voice that reaches far beyond our classroom walls. It’s pretty cool to know that people from all over the world are reading about and being inspired by OUR learning! Here’s a recent blog that Mr. C wrote called “Math Eureka!” It tells all about how the students in Mr.Cameron’s class continue to simply make him say “EUREKA”! HomeSHARE: Parents, talk with your child about how you have a presence online. What does your digital footprint look like? What will your child’s digital footprint look like? Do they already have one? If you use social media and are comfortable doing so, share something that our class has done this year. Feel free to share a link from our blog. In addition to our “HomeSHARE” assignments, Mr.C assigned 90 minutes of additional Home”work” to all students on Tuesday. To insure the parents were aware of the assignment Mr. C connected with the parents via Remind and had them work with their children to fill out a survey upon completion of the Home”work”. The feedback was nothing but positive! Watch for an update to my very popular blog post: WHAT IF Homework Looked Like This? that will include input from both students and parents. We have been talking a lot about the positive, purposeful use of technology and the power of connections. Over the weekend Mr.C received the tweet below from Jacob’s mom. His family travelled to Nipigon and were inspired to visit the Paddle to the Sea Park since we are reading the novel in class. Now our class is discussing the possibility of travelling there ourselves! Thanks for sharing your journey with us Jacob! We had quite a week of connecting! We connected with Marcus Pukonen (see week 3) who was in Hawaii while on a 80 000 km journey circumnavigating the globe. We also connected with our local environment during Fall Harvest at Fort William Historical Park where we used all five sense to experience and learn. This week we spent more time reading our welcome back tweets and spent time organizing and managing the data (see our “Math Investigations” page). As we are working on writing to specific audiences, each student recorded their favourite tweet and wrote specifically to each educator, explaining why their words resonated with them. Below are some examples. Home Extension Parents, ask your children what words of wisdom resonated with them. 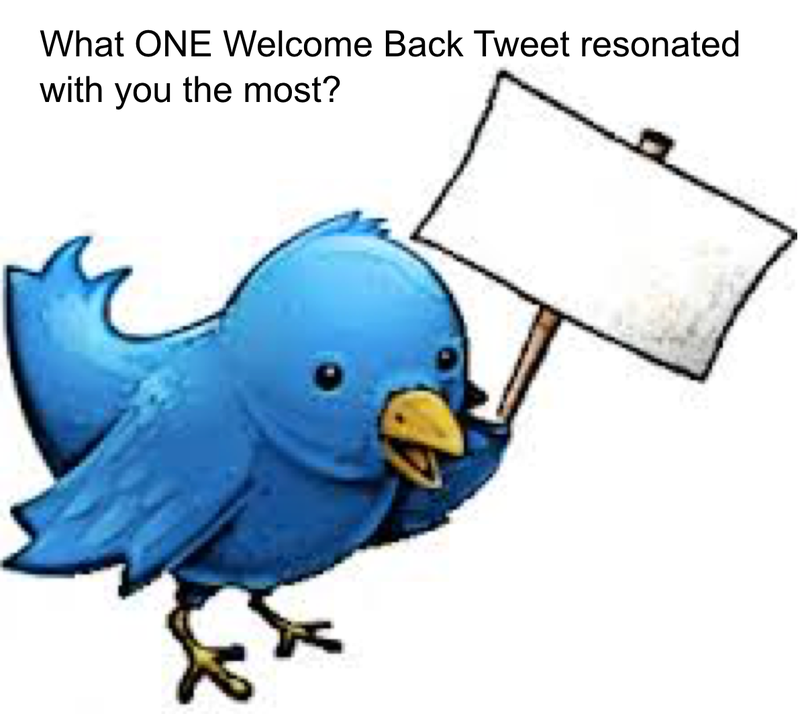 If they have difficulty remembering, refer to our Global Welcome Back Storify.